Do Hair Laser Combs Work? It's the big question many of us would love to know the answer to: Can hair lasercombs actually help prevent hair loss and stimulate new hair growth? We take a look at the leading hair lasercomb by HairMax. 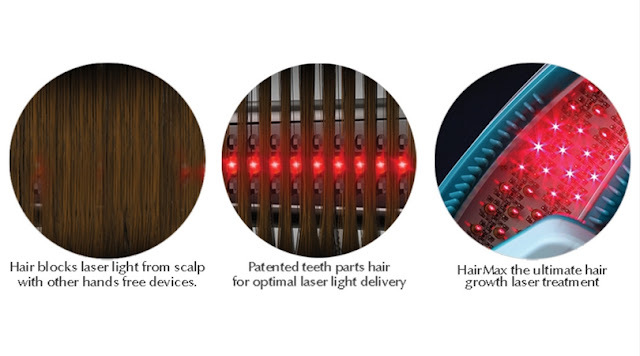 HairMax devices are the ONLY Laser Hair Loss treatments with Patented Hair Parting Teeth. These teeth are in integral part of treatment as they part the hair for optimal delivery of laser light energy to the hair follicles. Without the hair parting teeth, a good part of the laser light would be blocked by the hair and not effectively reach the follicles. Hair is a photoprotectant, which means that it acts as a natural sun blocker for the scalp. Our patented hair-parting mechanism parts your hair to create a pathway for the light to reach your scalp which allows for the ideal delivery of laser light energy to reach the follicles and achieve the optimal results. The hair growth cycle consists of three phases: Growth (Anagen), Resting (Telogen) and Transition (Catagen). The images above illustrate the various states of the cycle. At any given time, 10-20% of your hair is in the Catagen or Telogen phase waiting to be shed and replaced by an active Anagen hair (similar to the way a baby tooth is pushed out by a permanent tooth). HairMax energizes and stimulates hair follicles in the Catagen (transition) and Telogen (resting) phases causing a new Anagen hair to be formed. HairMax provides energy for healthier hair follicle stimulating more rapid hair growth and stimulates the root to produce a new healthier hair follicle. HairMax helps to reverse the process of miniturization and stimulates the growth of denser, fuller, healthier hair. In the “Growth Phase” or “Anagen Phase”, each hair grows approximately one centimeter (1/2 inch) per month for a period of 2 to 8 years. HairMaxhelps by providing energy to the hair growth process thus producing healthier, fuller hair. In the “Resting Phase” or “Telogen Phase”, the hair stops growing and ‘rests’ for 2 to 4 months and eventually falls out. The HairMax helps by stimulating re-growth of new hair. Termed “Vellus Hair” (light colored, short, fine “peach fuzz” hairs), the HairMax helps these fine hairs by stimulating them to grow into thicker, more mature hair. The root is dead and cannot be helped. 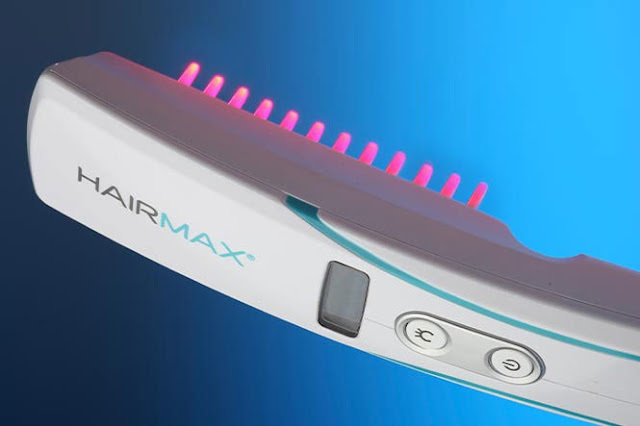 What did we think of the HairMax Lasercomb? The Hair Loss Review Centre tried and tested the HairMax Advanced 7 Laserbomb model for a period of 8 weeks. During this period, we had two testers: one male aged 37 who suffers from male pattern baldness, and one female aged 42, who suffers from thinning hair. "I used the HairMax Advanced 7 Lasercomb for a total of two months. I did not miss a session during this time. I wanted to try this device in an attempt to try to halt my male pattern baldness symptoms, of which I have been experiencing for the past few years. Unfortunately, I did not see much change in my hair during and after using this device. My hair continued to fall just as rapidly as when I started. If I had seen even the slightest of results, I would have continued using it for a longer period. Overall, I would say this product did not work for me." 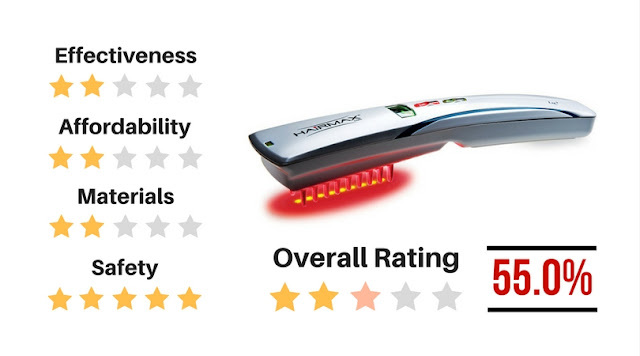 "I mjust say, the HairMax Advanced 7 Lasercomb did a pretty good job on my hair after using it for over eight weeks. I did notice slight increase in volume and tiny hairs popping up in places across my scalp where previously lost. I have suffered from chronic hair loss since I hit my thirties, and I have tried pretty much every treatment since. Some have worked better than others, and I would probably rate this product fairly highly on my list. I will continue to use this device in conjunction with other treatments I am currently taking."